As with some of my earlier creations, this one too was inspired by the fact that I've built such a model many years back that was produced by a company called ESCI, which is sadly not in existence any more. This project kept me busy for some time as about 95% of the stencilling that can be seen on this model was applied by me after having obtained very trustful information. The paint scheme itself also lends itself well to the Phantom as it looks quite the part in the air. Once again I trust that you’ll enjoy flying it as much as I do. All Credit to the creators of the original package. FS2004/FSX Antonov An-112KC based on An-70 model. Project aerial refueling tanker with two engines GE-90s.FMC by Garett Smith, panel and gauges for wide screen only (no VC) by Philippe Wallaert including GPWS callout. Original design model by Tsyntsar Victor, Kyiv, Ukraine, 2019. FSX/P3D Northrop F-20 Tigershark RNAF, Turkish Stars (Aerobatic team) and 'Iris' triple package. First flown in 1982, The Northrop F20 Tigershark was a highly capable light flighter with a range of 2750km/1700m . The ex payware Iris F-20 with 3 liveries - RNAF (Royal Netherlands Airforce), Turkish Stars (Aerobatic demonstration team of the Turkish Air Force) and Iris Demo. Added the fine liveries by Rene Spaan, Thomas Schedl. Fixed wheel sink, co-ordinated VC's. Manual included. Assembled and tested in P3Dv4 by Chris Evans. 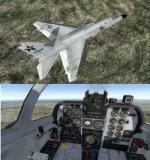 Should also work in FSX and previous P3D versions. FSX/P3D Raytheon/Beechcraft T-6 Texan II Military Trainer Pack 4. This is the ex-payware T-6 II Texan from Iris in 3 military liveries. PC-9 Royal Thai Air Force, RAF red and white and Thai AF Hurkus Demonstration. The Beechcraft T-6 Texan II is a single-engine turboprop aircraft built by the Raytheon Aircraft Company. A trainer aircraft based on the Pilatus PC-9, the T-6 has replaced the Air Force's Cessna T-37B Tweet and the Navy's T-34C Turbo Mentor. Special thanks to Iris Simulations/Dave Brice for allowing this to be distributed free. Thanks to Andy Nott, Kittisak Rukkaew, Ahmet Memetbeyoglu for the great textures. Put together and tested in P3Dv4 by Chris Evans. Should work in FSX and all previous P3D versions. 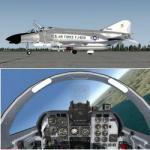 FSX/P3D North American Supersonic Ra-5C (A-5) Vigilante USN Package 2. 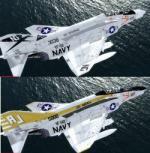 Liveries: US Navy RA-5C Vigilante RVAH-7 "Peacemakers" 610NE USS Ranger 1979; 603AJ USS Nimitz 1976 and "Checkertails" 601NG USS Constellation 1967. The Vigilante is an American carrier-based supersonic bomber aircraft manufactured by North American Aviation for the United States Navy betwen 1961 and was retired in 1979. The Ra5c variant saw extensive use in Vietnam as a tactical strike aircraft. It also holds several world records including speed and altitude. Original ex-payware model by Alphasim/Virtavia converted to FSX native format by LLS. Added the great textures by Antionio Diaz converted to dds format. Included bomb and missions files for those who know how to use them. Assembled and tested in P3D4 and should also work in FSX and earlier P3D by Chris Evans. The Tupolev TU-360 was a soviet project for a long range hypersonic (mach 6!) bomber. Original design by Tuomas Närväinen. FSX adaptation, 2D panel (no VC) for wide screen, gauges by Philippe Wallaert. See instructions for installation. 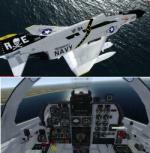 P3D/FSX McDonnell Douglas F-4B Phantom II US Marines Package. 3 USAF/Marines liveries ; Marines 45th TFS/2nd AD, Marines VMFA-333 Clean, Marines VMFA-351 AA. The McDonnell Douglas F-4 Phantom II is a tandem two-seat, twin-engine, all-weather, long-range supersonic jet interceptor and fighter-bomber originally developed for the United States Navy by McDonnell Aircraft. It first entered service in 1960 with the U.S. Navy. FSX Native model converted by David Robles from the Virtavia/Alphasim original. VC is the LLS conversion which near matches the F4 VC. Added the realistic high quality textures by Steve Bryant, Virtavia and interior textures by Virtavia. Tested in P3D v4.2 and should work in FSX and P3D 4.3 and earlier P3D versions. Package assembled by Chris Evans. ***NOTE: P3D aircraft does not show in select preview window but seems to show up in the sim without issue. An-188 for FSX and FS9 with changes and additions. Author: Tsyntsar Victor, Kyiv, Ukraine, 2019. 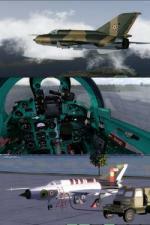 FSX/P3D MiG-21 MF Multi Livery Pack 3. Liveries included: Indian AF, Egyptian AF, Hungarian AF, Finnish AF and Slovak AF. 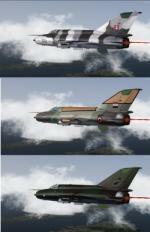 This is the superb high detail Mig-21MF created by Ivan Jurcaga (external model), Peter Priskin (internal model base). See Readme for further credits. The MiG-21 is a supersonic jet fighter and multi role fighter aircraft, designed by the Mikoyan-Gurevich Design Bureau in the Soviet Union. Over 11,000 were built between 1959 and 1985 and many are still in use today. For Start and other options press SHIFT 2 Credits for paints: Jens-Ole Kjølberg. Stefano Zibell. Antonio Diaz. Uses the default F16 sound. Thank you to Flanker 256 for reminding me about this aircraft with great new checklists. 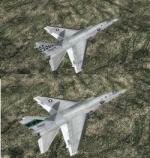 https://simviation.com/1/search?submit=1&keywords=MiG-21+MFB&x=17&y=12 Assembled and tested in P3D 4.2 by Chris Evans. Should also work in earlier P3D versions and FSX. Zip preview for images. 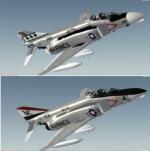 P3D/FSX McDonnell Douglas F-4B Phantom II US Navy 3 livery Package. 3 USN liveries ; USN VF-142_207AJ "Ghostriders" USS America 1972, VF-96 602NG "Fighting Falcon" USS Enterprise 1967, VF-84 'Grim Reapers'. The McDonnell Douglas F-4 Phantom II is a tandem two-seat, twin-engine, all-weather, long-range supersonic jet interceptor and fighter-bomber originally developed for the United States Navy by McDonnell Aircraft. It first entered service in 1960 with the U.S. Navy. FSX Native model converted by David Robles from the Virtavia/Alphasim original. VC is the LLS conversion which near matches the F4 VC. Added the realistic high quality textures by Mark Hellwig and interior textures by Virtavia. Tested in P3D v4.2 and should work in FSX and earlier P3D versions. Package assembled by Chris Evans. ***NOTE: P3D 4.2 aircraft does not show in select preview window but seems to show up in the sim without issue.